The My Nintendo website has updated itself once again, bringing along a new batch of rewards for loyal customers. This time around sees a bit of a revamp, with a 'Nindie Game Gold Point Rewards: Summer 2018' event taking place. 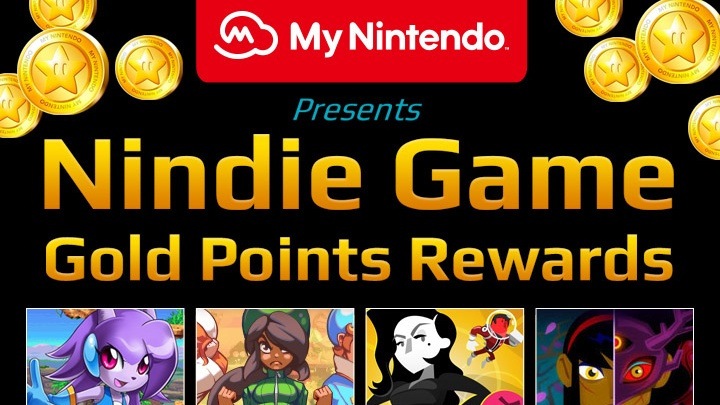 Currently, this Nindie game rewards event is only taking place on the North American version of the My Nintendo website - we'll have to wait and see if the European version also gets the same treatment. As always, remember that your Gold Points can now also be used towards Switch eShop purchases in all regions. WIll you be getting your hands on any of these deals? Let us know with a comment below. Freedom Planet still coming to the Switch, no? Freedom Planet has been on my «to buy» list for more than a year now, so hope this comes to Europe. Meh, I'd rather use those coins on digital Switch games. @SonOfVon Not everyone grabs every single game every week. I have over 60GB of games on my 3DS but I'm still missing Noitu Love: Devolution and Severed so I'm certainly getting them if the same games are going to be available on European My Nintendo as well. But still, only giving us Wii U and 3DS games as a reward, come on My Nintendo offer something good, like Club Nintendo used to with the Playing Cards, Stickers etc. Games for old systems! So generous! I'm sure a bunch of Switch indies would jump on a promotion like this. I would have preferred Shantae: Risky's Revenge, but Freedom Planet looks good. I didn't know about this game and just read the review. Seems worth the exact 110 gold points I actually have. Thats 1,1 euro. Can't be bad for that price. I was keeping them to make an Arcade Archives game cheaper, but I'll change region anyway to buy them, so the points wouldn't have been available say in Norway. Needs Switch games. I'd be interested in Freedom Planet, but not on Wii U. Put it on Switch and I'd gladly take it. Spent my gold points on the Mario + Rabbids DK DLC Don't regret that, but these are also good games to get for "free". This is nice. Unfortunately for me, I already have "Freedom Planet" and (the Wii U version of) "Severed" and have no interest in the other two games. Keep them coming, though. Bring back Club Nintendo and physical rewards. These gold points are such a rip off. Everybody should play Severed. Absolutely one of the best games I ever played on Vita. Well my 525 gold coins are safe, but thanks for the monthly reminder, I have 160 plat coins expiring so I'm picking up a couple of "starter guides". I wish Ntineod would offer up the monthly wallpapers a month in advance, by the time I remember to pick up a new month it's half over so I don't bother. As of now, no matter what Indie games they offer, My Nintendo's Golden Coins are worthless. However, even w/o physical rewards (because they obviously don't want those again), they CAN be made worth something, if A.) You got 600 coins instead of 300 for a $60 digital purchase), B.) Make what you can use them on in the eShop less restrictive. As of now, you pretty much can only use them on games & individual DLCs, not even DLC Season Passes (at least with how it's worded). And C.) Don't let the coins don't expire. I still don't get why they give you so little to use their reward system with, then give you a timer on how soon they can be used on top of that. But, those are just my opinions, so feel free to disagree. @Nintendo_Alski The gold coins give 5-10% money back on all digital purchases. That’s been pretty sweet at least. Was excited at the headline only to be disappointed by the rest. Already own the single Wii U offering, so I guess I will be burning a few more gold coins on even more useless digital crap to keep from losing them. Will probably be getting all of these, well the 3DS games. I have over 600 gold coins I think. On the 3DS/Wii U? Nah, buried those systems ages ago. Switch deals would be fine, the rest is eh. @shoeses Well more makes sense, there are several mobile games giving out plat coins, and I get a bunch each week just for clicking on stuff. As for better, well as a Switch owner there really are no gold rewards, so anything is better than nuthin. How well does Freedom Planet hold up in a time where a good 2D Sonic game exists? I'm sure 90% of us are no longer interested in Wii U games anymore. Not sure why they keep beating a dead horse. Ridiculous. I love how Nintendo does everything they can to erase the existence of WiiU from memory, and then runs sales prominently displaying it. @shoeses I'm not sure I follow your argument. You get 5% in gold coins for every digital purchase (including 3DS and Wii U eshops). You can use that on any Switch purchase, so no need to save up. Gold coins expire in a year, but you can use them any time so unless you just don't buy anything for a year they won't expire. Oh so another pointless promo with basically nothing to give away. Still giving out WiiU gamecodes? That's a joke. This is horible. Why is this not happening on Switch? Why are gold points worth 10x xas much on 3ds as they are on Switch? Wow, for me, the 3ds games are a great deal after such a huge drought in content on My Nintendo. Plus, I just happen to have enough coins for all of them! These are 3 games I have really wanted to play, but have fallen off my radar due to working on my backlog. No complaints here. Just glad to see some free games! Runbow will get you on the DLC. Can’t recommend Severed enough! I’m gonna give the other two a shot, and give the Severed code to my brother since he doesn’t have coins. These gold coins have saved me so much on my 3DS! Xenoblade 3DS discount, lots of Nindies deals and platinum coins discounted my DKC Returns 3DS and Animal Crossing New Leaf. I wish it would get me some deals on Switch, but I can’t complain too much for how it’s been for me so far. @chardir My argument is that the Gold Coins are pretty worthless value-wise. Yes, you can spend them on the digital purchase of a game or individual DLC, but the 'savings' are so minuscule it doesn't exactly matter. $9 in credit after spending $190+ isn't exactly what I'd call a good/balanced reward. @rjejr I have grabbed all I can with my gold points. But being only a Switch owner, I feel a bit overlooked by the system so far... Lost some gold already.... Expiring coins before switch rewards came on deck was low. But its business I guess. 3DS and Wii U only. Of course. Because why would we want rewards on the Switch? Bring Freedom Planet to Switch, then we'll talk. To be honest I've had Freedom Planet on the Wii U for ages due to Humble Bundle, never turned it on. @ICISAZEL We only bought our Switch in October when Super Mario Odyssey released so we have a couple more months before they start to expire. I'm hoping for some Switch rewards to be announced when they start talking about the paid online. I wonder if we get gold coins for the paid online subscription cost? I have a family of 3 gamers so we'll need to purchase the $35 option. Not quite tempting enough for me. .
@rjejr unfortunately I was a day one switch only use, so there was not much of a choice as to what to do with my coins until Nintendo started letting us use them to get money off of purchases. Alas its all I am saying..